Well, not in the form of an app… but more of a HTML5 web based map. 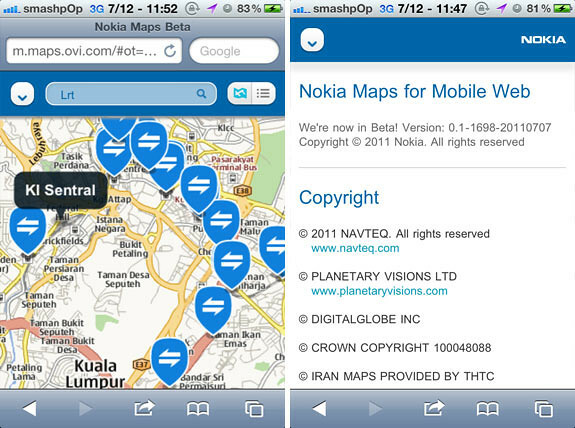 Since it’s not officially launched (they have not announced it in their blogs), the map still has some shortcomings here and there but generally it works fine in bringing the Nokia maps to users who are not on Nokia devices. which will then load up the HTML5 map. You can switch views by tapping on the bottom right button. The bottom left button will bring you to your current location (of course you need to allow the map to access your location via GPS). Pinch to zoom on iPhone/iPad Safari browser works very smoothly. Android browsers will get a pair of “+” and “-” buttons on the right side of the screen. 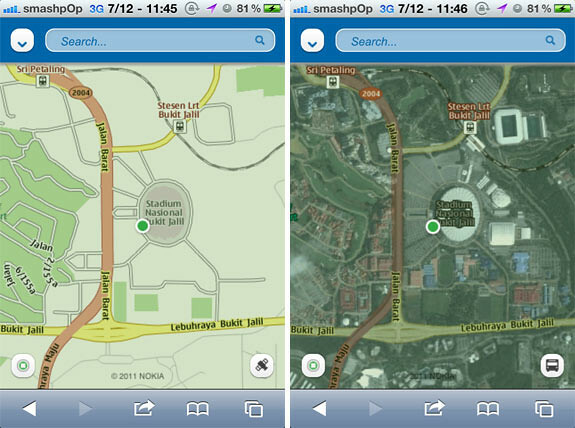 Tapping on the top left arrow will bring out the options; search, route (right screenshot). feedback & about. Search anything on the text box at the top and the map will display the results in pin form. You may also switch to list view from the button on the right side of the text box. The Nokia Maps is still very early in the beta stage. As seen on the ‘about’ screen, it was just released on the 7th July 2011. Hope it get’s improved in the future. Check out this video demo of the HTML5 map on Android and iPad 2.